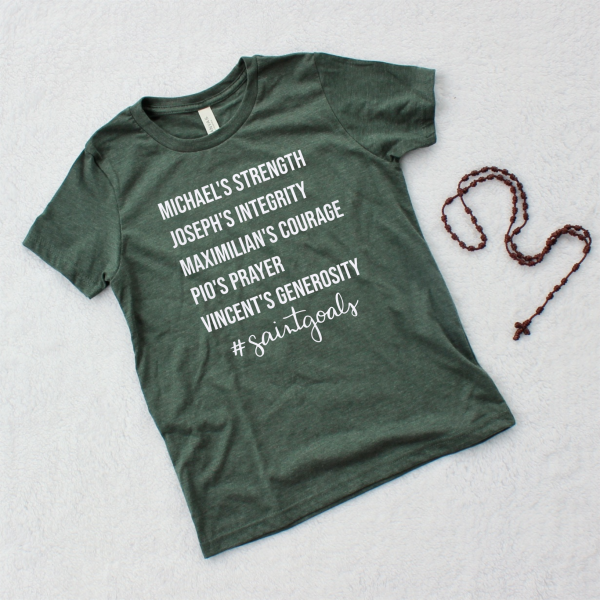 You and your young one have goals – show them off with this unique #Saintgoals design! Call upon specific saints, asking for their intercession in leading your child to holiness. These tees are super soft, blended cotton/polyester, ethically produced. They are high quality and sure to last as hand-me-downs! Design is hand-printed by me in white water-based ink and cured to stand up to frequent washing. Wash cool inside out, tumble dry. *This listing is for one heather forest green youth boys shirt. No props used in photos are included.